Poster titled 'volkstypen aus russisch-polen' - types of peoples in Russia and Poland. 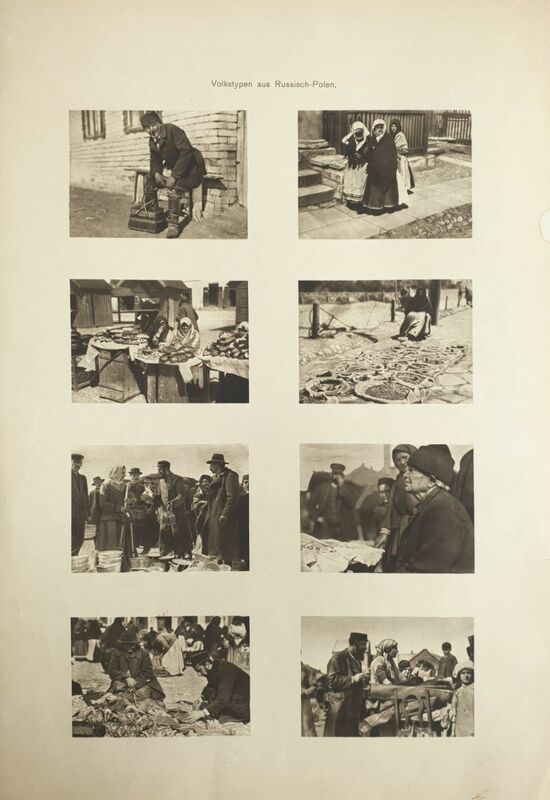 Graphic antisemitic poster with eight photographed pictures of views of Jews in a market, [female] Jewish merchants, an elderly Jewish beggar. Posters of this type were distributed in Germany and meant for the "enlightened" German people to show Jews 'as they are' where they live among themselves ['Juden under sich'], images such as these always filled the antisemitic Der Stürmer as well as Berliner illustriete Zeeitung, accompanied by virulently inciteful antisemitic articles entitled "Jews Among Themselves." The photographic style of Nazi propaganda focused on the faces of the subjects of the photographs to demonstrate the physical characteristics of races which were considered inferior. 34x54 cm. Thick paper. Very fine condition.